The tunnel, constructed in the early 1900s, is 16 feet (4.9 m) in height and 125 feet (38 m) long. 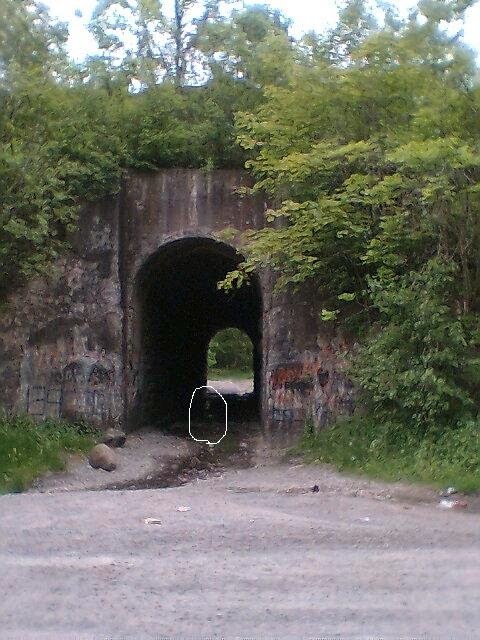 A local legend recounts that the tunnel is haunted by the ghost of a young girl, who after escaping a nearby burning farm building with her clothing ablaze, died within its walls. Several variants of the legend exist locally, one version has the girl set on fire by her enraged father after he loses custody of his children after a nasty divorce. Another tells of a young girl being raped inside the tunnel and her body burned to prevent any evidence from being found. All variants involve a claim that a match struck within the tunnel's recesses will produce the sound of the young girl's dying screams, this purported phenomenon is alleged to be the origin of the tunnel's name. An independent film, titled Limestone Burning, used the legend as a basis for the plot, and was filmed at the tunnel and in surrounding Niagara Falls, Ontario and Buffalo, New York, locations. Production was completed in the late summer of 2012.